Earn up to 3,040 reward points. Big rumble comes in small, feature-loaded packages. The TC Electronic BG250-208 bass combo amp took the power and tone that made the Bass Amp 2.0 line so popular, and then loaded it up with top-notch features. 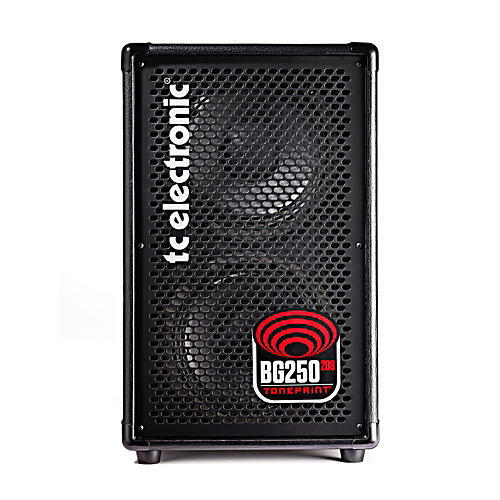 The 2x8" 250W combo comes equipped with a built-in tuner, 3-band intelligent EQ and, of course, TC Electronic's trademark TonePrint system that allows users to beam professionally made effects and tones from their smartphones directly to the BG250-208, controllable with an optional footswitch. Other features include six effects types - chorus, flanger, vibrato octave, SpectraComp and Bass Drive - a headphone output (which mutes the speaker), auxiliary input to play along with your favorite tunes, a mute switch for quiet tuning, and a balanced XLR output for direct recording in the studio or a clean feed to the mixer for live playing. 11.5" x 12.6" x 18.3"